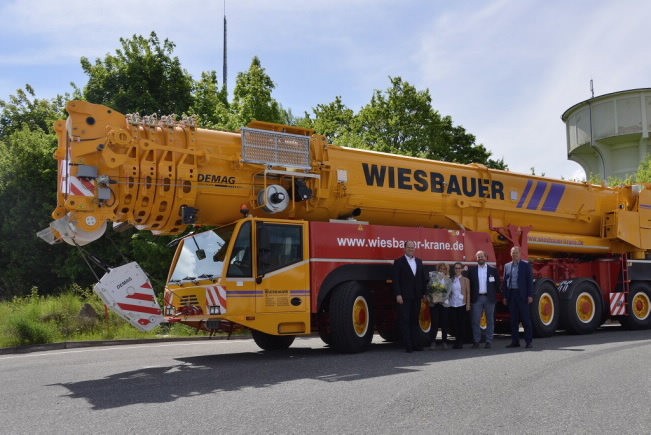 Bietigheim-Bissingen-based crane service provider Wiesbauer is continuing to expand the Demag contingent in its fleet: After buying two Demag® AC 160-5 cranes last December, and an AC 700-9 before that, the company decided to make an AC 500-8 all terrain crane its latest acquisition. “As far as we’re concerned, the Demag AC 500-8 is the only crane in its class that can be transported effectively because it can travel without exceeding the 12-tonne axle load limit. On top of that, the fact that the boom is 56 meters long means that the crane combines the longest boom on the market with excellent lifting capacities,” explains General Manager Thomas Wiesbauer, who picked up the crane in person in Zweibrücken together with his wife Sabine and his daughter Sissy. The crane was handed over by Sales Manager Michael Zieger and Terex Cranes EMEAR Sales Vice President Carsten von der Geest. The company did not happen on the Demag AC 500-8 by accident: “We already had the preceding model and were very happy with it. In fact, our crane operators also let us know that they thought it was a good idea to get another AC 500-8,” Thomas Wiesbauer reports. Regardless, the Demag brand was already highly regarded at Wiesbauer: “Demag is a force to be reckoned within Europe. It is a storied brand known for quality and innovation, and this continues to be true today, as we are able to confirm every time we use our two Demag AC 160-5 units. They work reliably and provide outstanding performance under all conditions,” Wiesbauer’s general manager points out. And as a cost-conscious Swabian and businessman, he also values the fact that the name Demag has a positive impact on his machinery’s resale value.